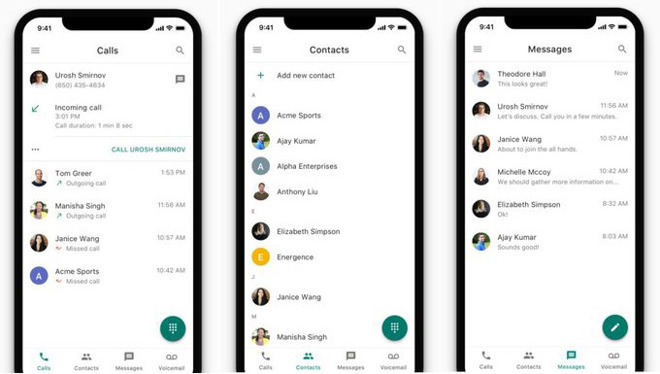 Interface changes include rearranged tabs, and the addition of a Contacts tab that makes it easier to find and call people saved in Google Contacts. Accordingly, people can tap an "Add new contact" button to grow the list without switching out of the app. Google has also changed the app's icon, and made miscellaneous performance and stability improvements. Google Voice is a long-running VoIP and text messaging service. Users get a custom phone number, which can be handy for syncing communications across devices, or avoiding handing out an iPhone's carrier-assigned number. Other tools include blocking, forwarding, and spam filtering, as well as backups for call history, SMS, and voicemail. Voicemail is automatically transcribed. Notably, Google Voice is only widely available in the U.S. The service is available internationally through G Suite, but only in "select countries for select customers." The iOS client is free to download, and runs on any device with iOS 10 or later. Calls using a Voice access number will still run up the minutes and fees associated with a cellphone plan.